What were the causes of the Peloponnesian War? One of the most important wars in the Ancient World was the Peloponnesian War (431-404 BCE). The conflict was a long drawn out war between Athens and Sparta and their respective allies. It convulsed Greece and changed the course of the Classical world. The war ended the Golden Age of Athenian Culture and arguably weakened the Greek world forever. What was the cause of the Peloponnesian War? The origins of such a conflict are complex. The primary causes were that Sparta feared of the growing power and influence of the Athenian Empire. The Peloponnesian war began after the Persian Wars ended in 449 BCE. The two powers struggled to agree on their respective spheres of influence absent Persia's influence. This disagreement led to friction and eventually outright war. Additionally, Athens and its ambitions caused increasing instability in Greece. The profoundly different societies of Athens and Sparta was also a significant factor in the war’s outbreak, which also had an ideological aspect. The origins of the Peloponnesian War lay in Greece's victory over the Persian Empire. The Greeks had combined under the leadership of Sparta and Athens to defeat the Persians, then the most powerful empire in Asia. In the aftermath of the Persian Wars, the Greeks were unable to maintain their unity. Cultural and ethnic differences were driving the Greek world apart. People’s first loyalty was often to their Polis or local city. While there was a definite sense of ‘Greekness’ and a common cultural heritage, it did not override the more local loyalties. This notion of Greekness was not enough to overcome deep divisions within the Greek world. As soon as the Persians left, the Greeks immediately began to quarrel with each other. Sparta, a deeply conservative society, had opted out of the war with Persia after their invasion was repelled. Athens continued the war against Persia and it formed the Delian League. This League was an alliance of city-states and islands that vowed to continue the war against the Persians until they no longer represented a threat to their alliance. Over time the Athenians, who were the largest maritime power in the Aegean came to dominate the Delian League. This era constituted the Golden Age of Athens and was concurrent with the lives of Plato, Socrates, and Aristotle. 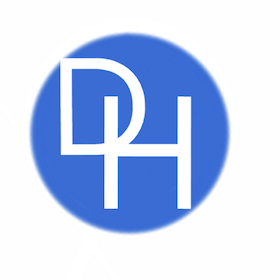 Gradually, the Athenians began to turn the Delian League into an Empire. Athens used its superior navy to intimidate its allies and they eventually became mere tributaries of the Athenians. Sparta soon became very suspicious of Athens's growing power. Sparta was the head of the powerful Peloponnesian League, which was comprised of several large city-states, including Corinth and Thebes. 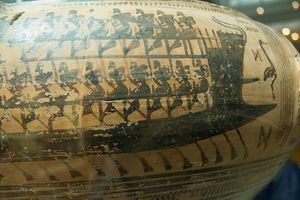 The League was very concerned about the Athenian fleet because it allowed Athens to dominate seas around Greece. Athens had also been turned into a formidable stronghold when the city constructed the ‘Long Walls’. These walls connected the city with its port, Piraeus and allowed the city to supply itself and made any siege of the city unlikely to succeed. Athens growing ambitions led to tensions with its neighbors and eventually led to a war. This conflict involved Athens and Corinth, with the latter receiving some support from Sparta. This war ended with a peace treaty and a ‘Thirty Years Peace.’ This treaty, in theory, guaranteed Athens and Sparta their respective spheres of influence. Corinth and other members of the Peloponnesian League were unhappy about Sparta’s lack of leadership. Some leading Spartans became concerned that their inaction would push the other major Greek powers, to side with Athens. During the so-called thirty Year Peace Athens grew ever stronger and in many ways arrogant, as seen in its increasing haughty attitude to its subject city-states. The underlying cause of the war was the rapid rise of the Athenians. They had grown from just another city-state into an Empire. During and after the Persian Wars, it had transformed itself and became a major trading and maritime power. It had developed into the greatest maritime power in the Greek world and could dominate the trade routes in the eastern Mediterranean. It had emerged as a great Empire in a quick period, and this upset the traditional balance of power. For many decades’ Sparta, had been the greatest military power in Greece. Sparta's well-disciplined and much-feared army was the source of its military power. 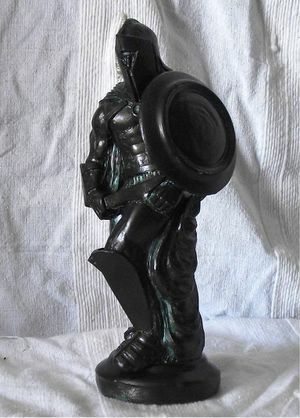 The Spartan Hoplite was considered the best soldiers in the Greek world. The rise of Athens meant that there were two great powers in the Greek world. These powers both had a network of alliances all over the Greek world and beyond. The Greeks became divided into a Spartan and an Athenian camp. Athens and Sparta had different spheres of influences, as outlined in the ‘Thirty Year Peace’ treaty and theoretically this meant that they both could have lived in peaceful co-existence. Athens controlled the coastal areas of Greece and the Greek islands, while Sparta, a land power could control the Peloponnese. Despite this, Sparta grew increasingly fearful of Athens and its main ally Corinth was actively encouraging it to attack Athens. In 440 BCE, Corinth urged the Spartans to wage war on Athens at the same time as Cornith was suppressing a revolt on the island of Samos. The Spartan Kings were cautious and decided to avoid conflict with Athens at that time. However, the Thirty Years Peace was under increasing strain. In the Spartan assembly, they were growing alarmed at the growth of Athenian power. As Athens seemed to be growing more powerful, there was a growing pro-war party in Sparta. They argued that the Spartans had to attack Athens before it became too powerful. The fear of Athens increasingly led the Spartans to prepare for war, even though there is no evidence that the Athenians had any designs on Sparta or its allies. Additionally, there were those in Athens who believed that a war should be welcomed. There was a strong ‘imperial’ party in Athens who believed that it was entitled to a great empire because of its role in the defeat of the Persians. Sparta's concerns were not entirely unfounded. The Greek historian Thucydides argued that Sparta's fear of Athens was the ultimate cause of the war. According to Thucydides, the growth of the ‘power of Athens, and the alarm which this inspired in Lacedaemon (Sparta) made war inevitable." Thucydides believed that the Peloponnesian War was inevitable because when a rising power confronted another power, they would inevitably wage a war against each other to further or protect their interests. Some later historians have also argued that war was inevitable between the two greatest Greek powers. It is still widely held that in international relations, the growth of a nation-state or empire will inevitably lead to rivalry and war with an established power. The Spartans and the Athenians were very different societies. Athens was a democracy, and it was very individualistic. The population played a very important role in politics and indeed it was a fairly radical democracy for the time. The citizens, (only free males) could directly vote on the affairs of the city. Sparta was almost the opposite of Athens in every way. It was a very stratified and conservative society. It was ostensibly ruled by two kings, from two royal families. The kings shared power with a council of elders (Gerousia). Sparta society depended on a servile population. The helots toiled the lands of Lacodemia for their Spartan masters. Sparta was a highly militarized society and the need for a strong and well-disciplined army was the main concern of the state. The state took boys from their family and trained them from youth to be soldiers. The role of women was to produce good soldiers and men were expected to be brave warriors. The profound cultural and political differences between the two great Greek powers contributed to the war. They had real difficulties understanding each other and this lead to mutual suspicions. Because of their different political systems and cultures, they were often ideologically opposed. Sparta favored the many oligarchies and distrusted the role of the common people in government. In contrast, Athens encouraged democracy and believed that it was the best form of government. This ideological rivalry between Sparta and Athens did much to increase tensions in the run-up to the outbreak of the Peloponnesian War and was a contributing factor. The tensions between the Athenians and Sparta grew. Thucydides noted that many believed that war was only a matter of time and that the Thirty Years Peace Treaty would soon be broken by one side or the other. All Greece needed was a spark to start a war. Thrace and Athens had a dispute and the Thracians, a Spartan ally, asked the Spartans for assistance. Athens decided to lay siege to the colony. The Athenians, at this time were also in dispute with the small city-state of Megara. They unilaterally banned the ships of that Megara from its port and its allies. This became known as the Megarian Decree. Megara was a long-time Spartan ally and this was widely resented, as it was seen as an attempt to make Megara completely dependent on Athens. This was not acceptable to Sparta and they believed that if Megara came within the orbit of the Athenians that they would use the port to weaken their position in Greece. Sparta, supported by her allies demanded that Athens withdraw the Megarian decree, but this was opposed by Athens. 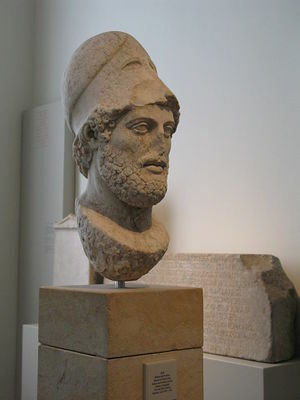 Pericles the de-facto leader of the Athenian Empire argued against such a move as it would only encourage the Spartans to make more demands. Thucydides states that the Corinthians condemned Sparta's lack of action until then and warned them that they had remained too passive for too long. They demanded action. Sparta was concerned that if it displayed any weakness that this could lead to its losing its pre-eminent position in the Peloponnese League. The Athenians were extremely confident and they knew that as long as they had their navy and their ‘Long Walls’ that they could not be defeated even if they could not beat Sparta and her allies on the battlefield. This strategy was recommended by Pericles to the Athenians and was much praised by Thucydides. Sparta began to contemplate war but they seemed unwilling to formally declare war. Then the situation spun out of control when allies of Sparta attacked the allies of Athens. The Spartans came to believe that they had no choice but to go to war. In 431 BCE, the senior Spartan king led an army into the countryside around Athens and laid it waste. This was the start of the great Peloponnesian War. The early years of the war were a stalemate because according to Thucydides writings, this was because the Athenians followed Pericles cautious strategy. Later Athens, encouraged by Alcibiades launched the Sicilian expedition to conquer Sicily during a lull in the fighting, known as the Peace of Nicias. This proved to be a disaster and it led to the loss of an Athenian army and navy. Remarkably, the Athenians continued to fight and the Spartans needed Persian help to defeat them. The destruction of the Athenian fleet at Aegospotami ended the war, and Athens surrendered the following year. Athens was forced to tear down its Long Walls and was fortunate not to be utterly destroyed. The Peloponnesian War changed Greece in every way. Nothing was the same after the war and Athens was never to be as powerful. The causes of the war, are that the Athenian Empire upset the balance of power in the Greek world. This greatly alarmed Sparta and its allies. The aggressive policies of Athens did not help the situation- the ambitions of the city-state certainly provoked the Spartans. Increasingly, the Spartans became very nervous about the growing naval and commercial power of Athens. At first, they resisted the calls of its allied to declare war on its arch-rival. Once Athens had issued the Megarian degree, it initiated a chain of event that led to the Spartan invasion of Athenian territory. The deep cultural differences between the two Greek powers was also a contributory factor to the increasing tensions that later exploded into an all-out war that consumed the entire Greek world. How did the Silk Road develop? How did Athens become the leading Greek city-state? When was Insurance First Used? What was the impact of the defeat of the Sicilian Expedition on Athens?